Do You Have a Vitamin Deficiency if Skin Sores Don't Heal? Your skin may reveal just how healthy your daily meals are. 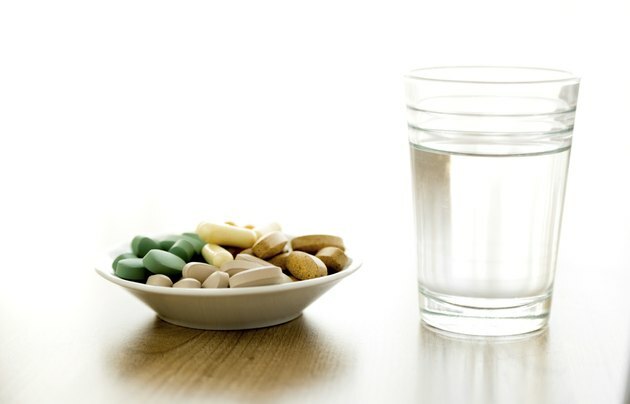 A deficiency of certain vitamins can cause scarring, pigmented spots and slow wound healing. It can also lead to a breakdown of the elastic fibers that keep your skin smooth and soft. Your body requires essential vitamins from a balanced diet to heal, soothe, repair and maintain your skin. Although skin sores do not necessarily indicate a vitamin deficiency, it's one potential culprit. In order for skin sores to heal, your body must control inflammation and destroy toxic compounds around the wound. Vitamin A, which is also called retinol, is a potent anti-inflammatory and antioxidant. This water-soluble vitamin is also needed to produce collagen, the elastic component of skin cells that helps repair and maintain the strong yet flexible dermis. The Cleveland Clinic recommends eating good sources of vitamin A such as green leafy vegetables, orange or yellow vegetables, fortified dairy products, fortified cereals and liver. Like other B vitamins, vitamin B-12 is essential for red blood cell and energy production in your body. Your body requires energy for every body reaction and function, including skin repair. Additionally, it plays a key role in producing DNA and keeping your nerves healthy. A deficiency of this nutrient can lead to anemia, nerve damage, depression and dementia. Research published in 2008 in the "Canadian Family Physician" reported that a vitamin B-12 deficiency can also have skin effects, most notably hyperpigmentation, darkened lesions on the skin. Vitamin B-12 is found in meat, poultry, fish, milk and dairy products, eggs and fortified cereals. A vitamin C deficiency can lead to notable skin effects such as poor wound healing and bleeding from the gums. This nutrient is essential for skin health for a number of reasons. The University of Nottingham notes that vitamin C is an antioxidant and helps form the elastic tissue collagen in skin. It is also needed to promote the growth of new blood vessels and direct immune cells to the skin sore to help beat infection. Foods that contain vitamin C include citrus fruits, tomatoes, spinach, potatoes, broccoli and fortified cereals. Vitamin E also has antioxidant and anti-inflammatory properties, which help soothe wounds in the skin. A review published in 2010 in the "Journal of Dental Research" notes that it may also help reducing scarring on the skin. The Linus Pauling Institute reports that animal studies have shown evidence vitamin E deficiency causes skin sores, but further research is needed to determine if it has the same effect on humans. Add foods such as vegetable oils, whole grains, avocados, wheat germ and green leafy vegetables to get plenty of vitamin E in your daily diet. How Does Skin Prevent Disease? Are Ridged Nails and Dry Skin a Sign of Vitamin Deficiency?